During Bethesda's E3 2015 stage conference they unveiled tons of details about lots of highly anticipated games. One of those games was Doom. Now I was really worried about this game because it's easy to completely trip, fall and ruin a perfectly good franchise, but Bethesda and id Software have proven that they know what they're doing with this game. 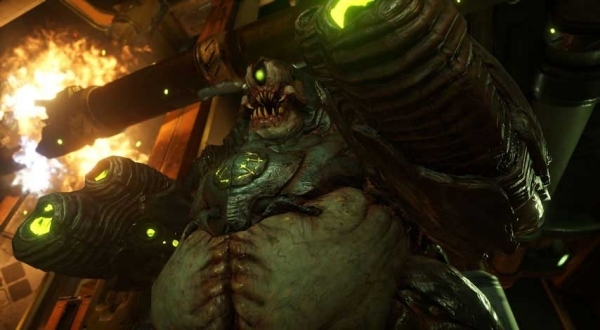 Now that all the worry and held breath are stored back up into the closet, id Software left gamers with tons of reasons to be excited about the upcoming first-person shooter and this list here narrows it down to the top 6 reasons to be excited about Doom, which is due for release next year on the Xbox One, PS4 and PC. One of the things I was hoping for dearly in the new Doom reboot was open level designs. The big problem with Doom 3 and Rage was that it felt like the actual shooting segments were cramped and tiny. Well, id Software completely threw the whole cramped and tiny concept out of the window by going back to what made the first two Dooms and their iconic expansion packs popular: open level designs. 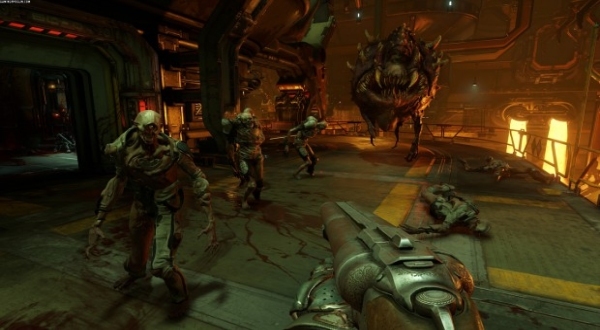 There are still some segments where you're trudging through corridors, but the whole idea of being able to run around, blast things to pieces and maintain a measure of breathing room via your own movement and tactical choices helps give the game the kind of replayability that was such an integral part of the first two Doom games. With that said, it's nice to see a new first-person shooter not taking the Call of Duty route with the single-player level designs. Modding is a huge part of the gaming community... on PC. PC gamers get to customize, modify and create new ways to play old games. Console gamers get stuck with DLC. Bethesda and id Software have decided to change this up by enabling everyone across every platform to make and create their own levels, custom modes, objectives, multiplayer content and even scripted mini-games. Id Software is putting the power of creation into the hands of gamers with their new Snapmap toolset, which comes complete with object manipulation parameters, AI behavior modifiers, node editors and event scripting. Instead of releasing the source code to make Doom mods, the tools are built right into the game and any and everyone will be encouraged to create, build and share their creations with friends and family. This is a massive undertaking and something both PC and console gamers should be thankful for in an AAA game. Weapons in FPS games seem to either fall into the character of ridiculously cartoony or stringently realistic (or realistic according to the standards of the game logic). In the case of Doom the game aims to find a balance right between over-the-top sci-fi and realistic enough to require some modicum of strategy and skill to stay alive. In other words, the weapons may be futuristic and sci-fi but they aren't over-powered. However, the weapons can be made to perform unique tasks in the game beyond their normal functions. Collecting the weapons is only half the fun. 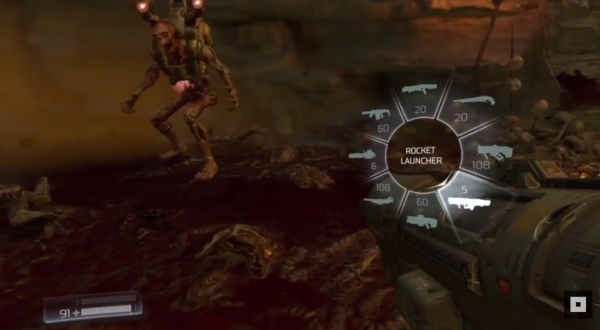 This new Doom allows players to acquire upgrades and modifications to the weapons to battle certain kinds of enemies. This adds a bit of strategy to the fight, so instead of just shooting rockets or blasting demon hordes down with the super shotgun, you're measuring which guns to use for which baddies and which modifiers to take down certain enemies. I can't believe they did it but id Software found a way to actually improve on the original Doom's weapon loadout and functionality. In the old Doom games the monsters weren't necessarily the most brutal or smart, but they were relentless and difficult to thwart at times. The first two Doom games gave us enemies that made us run and hide and attempt to find a bigger gun to kill them if we were low on ammo for a certain weapon. In Doom 3 the monsters were more like jack-in-the-box villains who would pop out just to get destroyed. 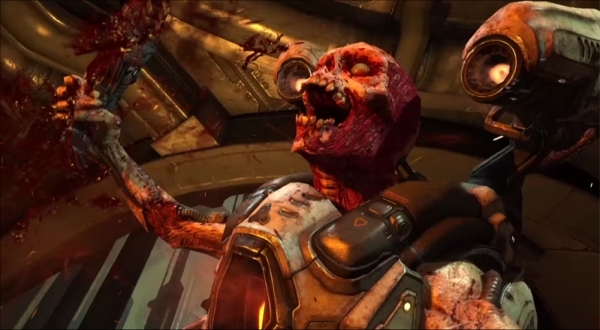 For this newest Doom id Software demonstrated AI that is both aggressive and relentless. It was awesome to see a variety of enemies who would just keep on ticking until you put them down for good. The gameplay was frantic and fast; and when the Revenant flies around, knocks the Doom Guy off his feet and proceeds to rip him to pieces it was an eye-opening revelation that enemies won't just stand there waiting for you to kill them. You'll have to earn those kills. No matter what the cultural critics recycling bad political commentary from the 1990s say online, people flock to Doom for its ultra-violence. It's as well known for its violence as Mortal Kombat is for its Fatalities. It's about being on the edge of your seat, mowing down countless hordes of hell's undead armies and knowing you got out of there in one piece. Also, the gore ties into the game's grim and foreboding atmosphere – a technological hell you have to escape from. It's a rare visual style, combining demonic artistry with industrial machinery and computerized cybernetics. Having to result to cutting a Cyber-Demon into pieces with a chainsaw or decapitating an Arch-Ville adds a satisfying sense of victory to each encounter. 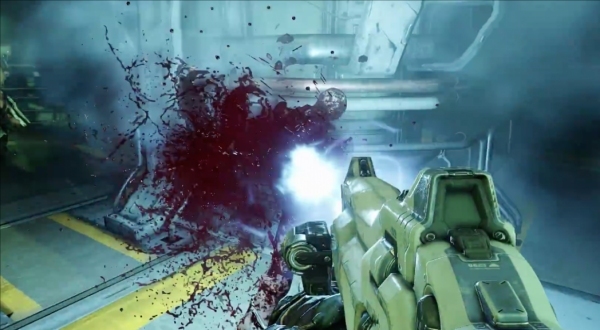 Also, seeing the gib blast to pieces from a point-blank blast to the face of a demon with the shotgun never gets old. In addition to bringing back health packets and item scavenging, id Software went and did something I didn't think they would do: they made the Doom Guy fast again. You can now run fast. You can run fast and shoot and kill things quickly. With the added modding tools you can speed the game up even more, which should make old-school enthusiasts very pleased. I was originally worried that the game would be another horror-survival, slow and plodding experience but it looks like they've found a fine balance between slow and tense moments where you're waiting to see what's coming up next and fast-paced, arena-style encounters where you're running around fast and furiously attempting to kill everything in sight. 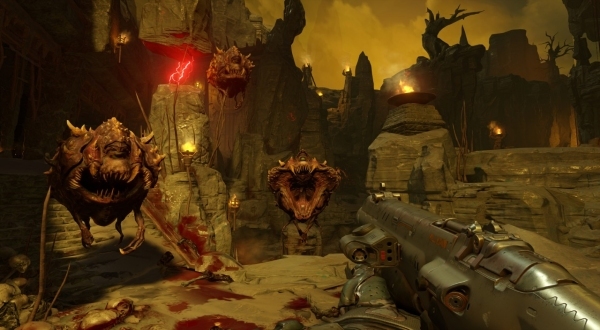 I didn't think they would be able to pull it off but the gameplay footage id Software showed off during Bethesda's E3 conference has left me excited and relieved for the future of Doom.